“I love the Climate Seal windows & brag/tell people about them and the improvement in my home heat efficiency every chance I get. The first month they were installed (January 2009), my energy bill decreased about 40%. My home was built in 1920, old but not historic but I do live in a historic area. Replacing the old, original windows was estimated at $4000-25,000… neither was satisfactory for me. After reading about the product, & calling the local phone number for more answers… I decided it was the perfect answer! “I wanted to write and follow up on the installation of the Climate Seal Window Inserts. First, I want to commend Matt for stepping in and getting things ‘back on track’ in order to get the installation done. He came from Charlotte (2 hours away) and assisted on the day of installation. Between the three of them, they got the job – 14 windows – done in one day. With Matt’s expert help, everything was done perfectly. The job was everything one could ask for. The inserts have more than lived up to expecations. Might be helpful to know that I am heavily into sound since my hobby consists of designing high performance, multi-channel sound systems, a.k.a. ‘home theaters’. My personal system is a 7.2 design. So, I’ve been using sound level meters for many years in calibrating home theater systems in order to obtain the best sound. We live right by a highway, which was one of the main reasons we needed the window inserts – to cut down on the road noise. I am happy to report to you that this goal was definitely realized. Road noise is far less intrusive with the inserts in place than before. I did attempt to get some readings on this but, it’s difficult, since the variation in sound levels is go graet, depending on ‘what’ is going by out there. Maybe a scale from 1 to 10 would be better. It WAS about an 8. Now, it’s down to a 4 – which is consistent with the 50% noise reduction figure you quote in your product literature. Pretty much exactly what we got. But, I do have some specific for you. We have a whole house generator located just outside our home. My reading in the house before the inserts was about 40dB – quite loud. But after the inserts were installed, I got a reading of 32dB – in the exact same location. The sound level has been greatly reduced. Just what we were hoping for. “I believe it was you that referred us to Tony from Maine for our thermal interior storms. My husband and I felt it important to tell you our experience. We moved to a 1780 antique colonial in August of 2013 that needed a new heating system. We installed a state of the art, $26,000.00 Navien boiler and it wouldn’t heat the house. The company was great and they were sending out their operations manager to rework the system. In the meantime I had Tony here, he measured, I picked out paint colors and off he went with the 18 window order. We didn’t plan on getting them as soon as we did but Tony had someone cancel on him and he came down on a Sunday morning (with an ice storm pending) with two others and installed all 18. “We live in a renovated candy factory with large windows facing a busy street. While the windows provide great light they also let in a lot of noise and cold air in the winter. Replacing the windows was not possible. I researched multiple options, but I knew from my first call with Matt I had found our solution. He took the time to understand our situation and gave me a very thorough, honest and thoughtful recommendation. I appreciated having the installer come out to measure the space, wo we didn’t have to worry about the fit. The windows are great – very well constructed. We ordered them custom-painted. They match the existing windows, are just like Matt said, you really don’t see them. The noise reduction is significant. The installers were very professional and did a good job. “Thank you so much for the exceptional customer service you provided, during the measuring, ordering, shipping, and installing the Climate Seal inserts. Especially when you took the time to return my panicked call on a Sunday while you were enjoying your day off! You prevented a major domestic blowup. Anyway, after your call, husband reinstalled the frames the way they were intended to be installed, and all of the inserts fit great. They are air tight but still easily removed. I love this solution for keeping my quaint 40’s windows, and still getting the insulation against the cold. I will recommend you and your product to anyone who is in need of a similar solution. Our window inserts have completely transformed our home. We no longer hear noises from the street; in fact, we have to strain to hear anything whatsoever outside. The temperature in our home is no longer unpleasant, and the heater no longer runs incessantly. One can find cheaper window inserts elsewhere, but these were definitely worth every penny, not least because Larry personally sees to it that the windows are properly installed. 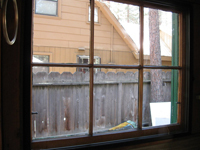 “We are thrilled with our Climate Seal™ interior storm windows. After getting estimates for replacement windows in our 1930 English Tudor style home, we looked for a more cost-effective way to reduce heat loss. Our single-pane metal windows are all over-sized it was important to preserve the look and style of the period. The Climate Seal™ system exceeded our expectations, at a cost of less than 25% of our lowest estimate for replacement windows. Our home is located on the main street in our town. We also have an active railroad that runs behind our home. The reduction in exterior noise is amazing. Not only do we now have a cozy house, it is also peaceful and quiet. Having the installer come to measure the window openings before ordering was well worth the expense. Your installation team was professional, hard working and a pleasure to have in our home. The cost of the installation labor was incredibly reasonable for the caliber of contractors you sent to us. We are 100% satisfied customers and would recommend the Climate Seal™ to our families and friends. “This message cannot adequately express how thrilled I am with my new window inserts. I’ve been enjoying them for several weeks now and I must say that the noise reduction is considerable. Although I was pleased with your work upon completion, I am now even more elated having seen my energy bills reduced along with the noise. No small achievement considering the triple-digit temperatures we have been experiencing here in the DC area. M. Gelber – Washington, D.C.
“We are quite satisfied with our new interior storm windows. They have made our home feel much cozier and better insulated from the weather and noise outside. The sound insulation is quite significant in some rooms, less so in others but still noticeable. While the windows haven’t eliminated road noise, they have muffled it considerably. Overall, the house seems much tighter. Dealing with you and with your installers was a pleasure. It was easy to communicate with you via e-mail and phone to work out the details of the project, and your installers were great. I love the fact that you handled all aspects of the job, from initial measurement to final installation, even though it required several trips from Maine to our home in Massachusetts. We didn’t have to do anything, except write a check! This was a great convenience. Thank you for providing such excellent service. “Thanks for your call. I am happy to report that the Climate Seal™ windows have worked out very well for us. We are pleased with both the look and the performance. When we inquired about the Climate Seal™ system, we were seeking to achieve several goals. First, we have some unusually-shaped windows in our Victorian house, particularly a large Palladian window in my third-floor home office, for which we had been unable to locate storm windows for many years. Second, our house is located on a busy street, and we were looking for noiseproofing in a few key rooms. The Climate Seal™ windows have helped us to achieve both of these goals. Drafts have been noticeably reduced, and the rooms retain warmth much more effectively. The street noise has been significantly reduced, as well, helping us to create better working and sleeping environments. Further, the windows are virtually unnoticeable, not at all interfering with the appearance and the historic integrity of our home. “The installation went beautifully. We are very pleased and will most definitely recommend these to everyone. Looking forwoard to colder weather for the real test. The clarity and immediately noticed noise reduction is great.